All good cookies start out the same: as good cookie dough. My husband prefers his cookies as “pre-cookies” – cold and uncooked lumps of dough straight from the mixer bowl while dodging my dough scoop. And growing up? So did my siblings and I. There was no fighting over who would get to lick the beaters in our house. No, sir! Two beaters, one rubber spatula, and a mixing bowl. 4 batter-covered items, 4 kids. Something tells me my mom knew exactly the kind of mess she was avoiding when she baked. I immediately dumped the Foodie Baby in my husband’s lap and ran for the kitchen. And when she’s old enough to have one of these cookies, she’ll understand. And if she’s really my kid, she’ll approve 🙂 These cookies are puffy and gigantic, over an inch thick – closer to two! And I can’t tell you how long they keep their tender, puffy goodness… they don’t last very long around here. They are definitely replacing the old house favorite. Big, fat chocolate chip cookies. Preheat oven to 375. Beat the cold butter and both sugars until just combined. Add the eggs and vanilla and beat just until incorporated. Divide the dough into 12 balls, approx 4 oz each (think a little larger than a golf ball; a slightly rounded 2.5-inch scoop will do the trick perfectly) and place on an ungreased baking pan. Chill the dough for 20 minutes. Bake for 18-22 minutes or until browned on the edges and set in the center. Let cool completely on the pans before transferring to airtight storage. Okay, anything calling for shredded butter I have to try! These look amazing! I love thick, cakey cookies and these appear to fit the bill. Thanks for sharing! Oh wow…these look so good! I love a chocolate chip cookie with a good amount of depth to them! These look really tasty! I love that they look so thick instead thin! These cookies look fantastic. Now I have another CCC recipe to try out!! 4 oz cookies! That’s crazy talk. And by crazy I mean crazy delicious. I definitely need to try these. Yesterday. Like you. This looks like an incredible cookie! At first I thought it was a scone =D Does it kind of have a crumbly texture because of how the butter is cold? I’ve been so hooked on the melted butter choco-chip cookie recipes, that it’s refreshing to know I might be missing something with cold butter. I’ll keep this in mind next time I’m ready to make some cookies! These look amazing, but I just can’t dirty the whole food processor to shred the butter. Maybe i’ll try them without shredding and report back! I agree with Wendy. I am DYING to make these, but I’m pretty sure my food processor does not have a shredder. How would these be if the butter was just cubed or something similar? I’m a fellow Texan, but I love the Levain bakery in NYC! I make sure to swing by every time I’m there. This definitely reminds me of their wonderful cookies – will have to give it a try soon! 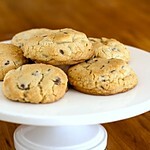 Levain’s cookies simply cannot be beat, but I’m definitely going to give these a try! Lauren – My food processor came with a grater disk. If it hadn’t… I’d probably hand my husband a frozen stick of butter and the cheese grater and let him know he’s the only thing standing between us and dessert 🙂 The shredded butter incorporates really quickly without having to overwork the dough and is probably what makes them almost scone like in texture. After staring at these since March I finally had a chance to make them. I don’t have a food processor but I just took the cold butter and used my cheese grater. I’ve never had Levain cookies, but mine came out great with my cheese grater shredded butter. How long do you think the cookie balls would keep in the freezer before baking? Is this something I can just freeze and bake a few cookies as the craving strikes? Absolutely – that’s exactly what we do! I freeze them on a plastic covered plate or tray until they’re frozen solid (a couple hours or so) and then move them to a gallon zipper bag. They need a few extra minutes when baking from frozen, but they’re as good as making the dough fresh. I just made these for the second time. Both times they came out looking exactly as the pictured and taste great. I was lazy and skipped the food processor step and just cut the butter in small chunks.